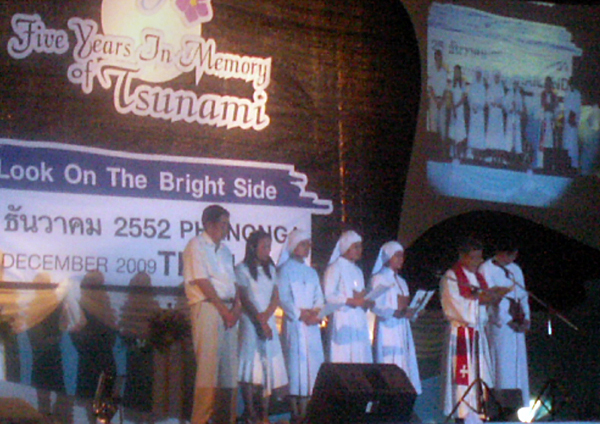 KAO LAK, Thailand – At the annual December 26 remembrance ceremony for the 2004 tsunami in Phang-nga province in southern Thailand, Pastor Suchart Srikikarn, president of Takuapa Sahatay Lutheran Church represented the Christian faith. He was invited by the provincial governor to attend “Five years in memory of the tsunami.” The event takes place at the site of a coast guard vessel swept a mile inland by the force of the tsunami and now serves as a memorial to the thousands who lost their lives. Jurin Laksanawisit, Thailand’s education minister presided over the ceremony. The pastor’s participation provides him the opportunity to proclaim the Gospel to the mostly Buddhist and Muslim audience. The invitation is recognition of the Christians who perished in the disaster and the church’s involvement in the relief efforts. Following the tsunami, Pastor Srikakarn’s congregation, along with the Kok Loi congregation served by Lutheran Church–Canada’s missionary Pastor Suchart Chujit, organized relief efforts with funds provided by members of LCC congregations. Both churches grew as a result of the contacts made following the disaster. Through the Sahatay Church, LCC is still supporting the education of 12 orphans. At the conclusion of the remembrance ceremony, participants released 2552 lit lanterns into the air in memory of those who died. A Christmas service in Takuapa prevented Pastor Srikikarn from attending the lantern ceremony.